Are you hoping to graduate from Oceana? 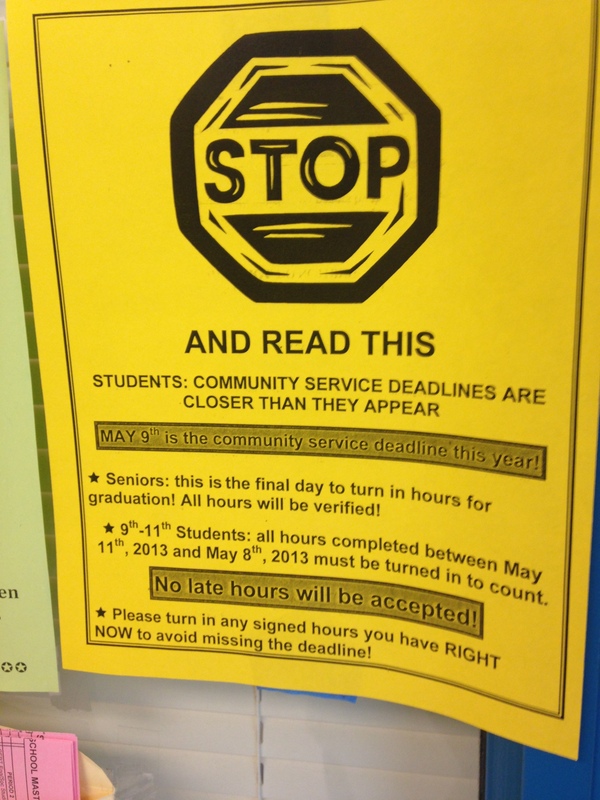 Well, don’t forget that the last day to turn in your community service hours is May 9th, 2014. Don’t let your hard work go to waste!!! Seniors, this is your final day to turn in your hours for graduation. All 9th to 11th graders, your hours from May 11th, 2013 to May 8th, 2014 MUST be turned in to be counted. To turn in your hours, make sure you have the community service form filled out, which is available in front of Ms. Ambrose’s office in the counseling hall. If you don’t turn it in this year, turning them in next year will not be allowed. Also, your hours will not be valid after May 9th. To avoid missing the deadline, turn in all the hours you have now. If you have any questions or concerns, please talk to or email Ms. Ambrose.